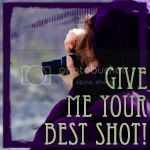 Learn from me…a third time mom turned first time mom? And you say to your husband “we need to lower her crib mattress”. Don’t wait. Don’t keep saying it every day. Go get the allen wrench tool-thingy and lower the dang mattress. In fact, just go do it now. Because one day, she will wake up from her nap, you will be downstairs and you’ll hear a thud and know exactly what happened. Then you’ll also hear the scream. A scream you know mean get here 5 seconds ago. Yes, she had gotten out of her crib. I found her on her belly on the floor. She had taken out her lamp on the side table and changed the sound on her sound machine on the way down. I made it upstairs in record time and immediately scooped her up of the floor. She cried for a bit longer, then calmed down. I checked her over and she seemed okay. 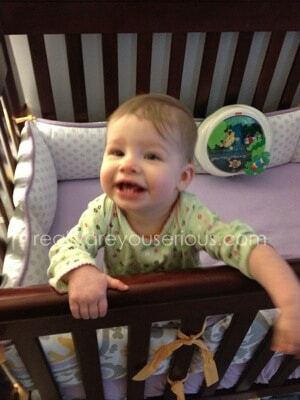 I then went downstairs, found the allen wrench and immediately lowered her crib mattress. Yes, I had been saying I needed to do it for a month and a half and it probably took me 10 minutes! We came downstairs and she ate, then wanted to get down (no snuggles for her) and started doing this craziness. At her very next nap (with the mattress lowered and yes there is a bumper…), I caught her on the monitor standing up (I had no idea she could do it) and then found her standing up when I went to get her. 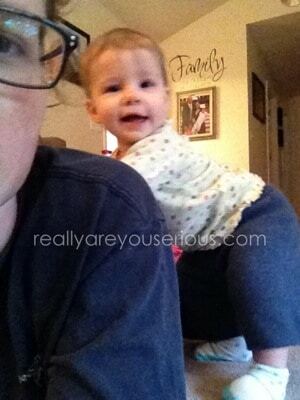 Later that day, she crawled over to me and started whacking me on the back and stood up on me. She does have a little battle wound from her fight with the table…her nose is a little red. I guess that’s what she bumped on her way down. And apparently, she’s also learned how to take her shirt off in her sleep? This really did happen, so please do take note. Remember to lower the crib mattress as soon as they start moving and/or pushing up. It’s only a matter of time before they learn these new tricks and this could have ended very differently. Oh no!! 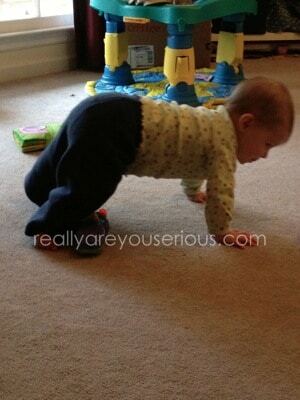 I’m def going to take heed to what you say when it comes time for Baby M! She’s just too cute and funny how they reach all these milestones in a meter of seconds!!! Yes, as soon as he starts doing anything other than laying down! Seriously, because it happens way too darn fast. Oh, yes, me too! She’s a tough cookie! I meant to blog about this, but we totally learned the hard way too. Baby S didn’t fall, but I did find him with half his body out the crib at 2 am because I decided to go to the bathroom before getting him out the bed. We hadn’t thought about lowering the crib mattress despite seeing him stand in his pack n’ play and lowering that it just totally went over our heads. Crazy how we don’t think they can do things yet, right? And, the video monitor obviously wasn’t on when it happened. Whoops. Thankfully, she’s okay! yikes!! glad to hear you both survived! what kind of monitor do you have? is that the temp of the baby’s room? I know, right. Super traumatic! It’s a Tommee Tippee Monitor (I reviewed it a while ago, so I linked you to it). Yes, it shows the temperature in her room, which is super handy. Oh yes…I know. She also likes to rub her face on it and sort of soothe herself to sleep. So I leave it in there (yes, I know the recommendations to not have it in there). Definitely a stinker. Glad to hear that she’s a-ok! No kidding. 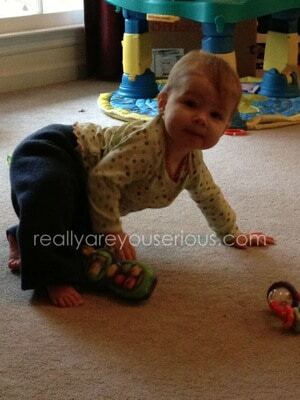 One day she sits in place and the next she’s crawling and pulling up! I’ve caught both big sisters picking her up. Usually right after I hear a scream and crying. We seriously call her our monkey…I don’t think I’ve written that here, have I? Too funny that you nailed her little nickname! Don’t I know it. It’s too fast! so so so glad she was ok and that the mattress was easy to move down! ps. sweet girl? please sit down – mommy and i can’t handle this!! you are a baby!! I think sometimes she thinks she’s as big as her big sisters. I’m not ready for it.